Brown in his late Sunday veto argued that the mandate is a "slippery slope" that could lead to other new demands for personal information from Trump and other candidates in the future. "Today we require tax returns but what would be next?" Brown asked in his veto statement. "Five years of health records? A certified birth certificate? High school report cards?" He also questioned whether the law is constitutional and would have survived court scrutiny. "While I recognize the political attractiveness—even the merits—of getting President Trump's tax returns, I worry about the political perils of individual states seeking to regulate presidential elections in this manner," he said in his veto statement. "A qualified candidate's ability to appear on the ballot is fundamental to our democratic system," he added. "For that reason, I hesitate to start down a road that well might lead to an ever-escalating set of differing state requirements for presidential candidates." Political observers nationwide were watching the bill's fate closely. It was one of two measures California Democrats hoped could increase the power of the state’s presidential primary process and help stymie Trump's re-election efforts. Brown signed the other effort—a bill that would move California's primary to early March—into law last month. Supporters argued that the bill was necessary to provide the transparency needed to educate voters. State Sen. Scott Wiener (D.), who cosponsored the bill, has said the bill is about "giving the American people the honesty and transparency they deserve." "As the months continue to go by in the disastrous Trump administration and the investigations and conflicts of interest pile up, it becomes more and more clear how critical basic transparency is in how we elect our president," he said when the bill passed the state assembly. 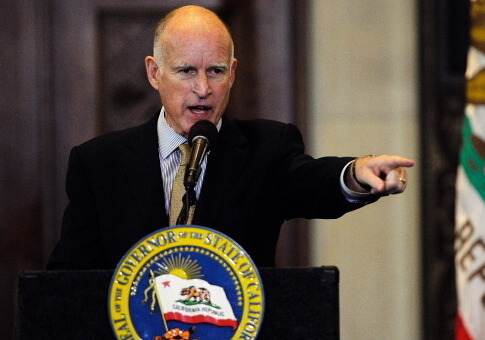 Republicans have pointed out that Brown refused to release copies of his tax returns twice during his political career, when he campaigned for governor in 2010 and 2014. He also only released part of his returns during his unsuccessful presidential run in 1992. This entry was posted in Politics and tagged California, Donald Trump, Jerry Brown. Bookmark the permalink.